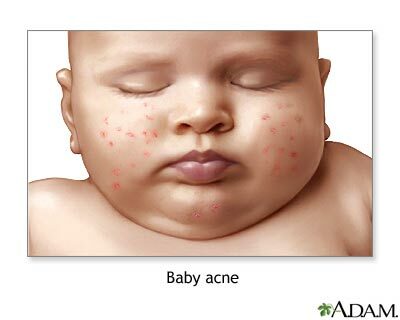 At 1 to 3 weeks of age the infant may develop an acne-like rash on the face which may extend to the scalp and the chest. Do not attempt to treat this rash. The rash resolves on its own without leaving any scars or blemishes. If there are large pustules or cysts, call my office for an appointment. Acne is the physical change is the outer layers of the skin caused by several factors. It is usually triggered by the hormonal changes of puberty. Increased skin oils accumulate below plugs in the openings of the hair follicles and oil glands. 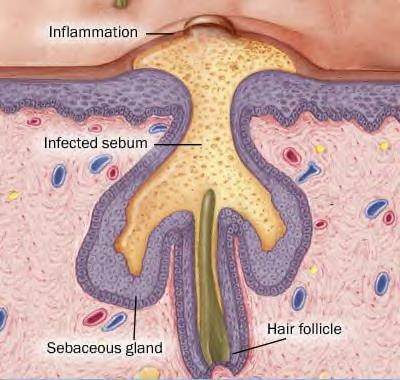 In the area below the plugs, secretions accumulate and skin bacteria grow. These normal bacteria cause changes in the secretions and make them irritating to the surrounding skin. The result is usually a pimple, and occasionally may develop into a larger pocket of secretions or cyst. Blackheads are formed when the surface secretions collect and the tanning pigment called melanin is deposited causing the dark colored pimples. Cleanliness and good hygiene are important principles for everyone. While excessive dirt will certainly aggravate acne, scrupulous cleaning will not prevent it. I tell adolescents to wash their skin only to keep it clean and comfortable. Extra washing or very vigorous scrubbing is not only unnecessary but potentially harmful. Greases and creams on the skin may aggravate problems. Over-the-counter acne medicines may be quite helpful for many adolescents. The active ingredient of benzoyl peroxide is important. Look for it. This ingredient dries the pimples and helps kill bacteria on the skin. Diet is not an important factor for most people. Some foods obviously do aggravate their acne and these foods should be avoided or reduced. But concerns regarding greasy foods, ice cream, chocolate etc. are overexaggerated. Sunlight may have definite effects on acne and mild tanning during summer months usually reduces the severity of most acne. Most acne may be improved by simple home therapy. When you do not feel your adolescent is happy with the progress they have achieved, I have several approaches I can use to control and reduce the severity of the acne. I refer patients when there is no change or satisfactory improvement after I have used prescription treatments.